2.Adopting dual-level precision screw and imported Panasonic servo synchronous motors, work stably, ensure Y axis double side screws synchronous runing, small error, stable and reliable, which is guarantee of high-speed and stable printing. 3.Whole steel frame structure tempering treatment, which adopt dual guide rail steel frame structure, print head can be more steady, running can be more stable and faster. 4.Taiwan HIWIN mute double guid rail, high resolution, low noise, durable, ensuring the car work steadily, decreasing shake, spraying ink will be more stable and reduce deviation. 5.Equippment equipped with several emergency brake switches can ensure body and equippment safety. 6.Equipped with emergency back up power supply, when the computer powers off of suddenly, can still maintain the negative pressure system, keep the negative pressure system working properly and enter into the working state quickly when power on. 1.Automatic measurement system:can automatically measure with senses distance nozzle and media, which eliminate the procedure that we measure thickness by ourselves, avoiding damage caused by human error, efficient and accurate. 2.Unique saving feeding system, oversize and overweight print samples can be easily moved from adsorption platform, save time and labor. 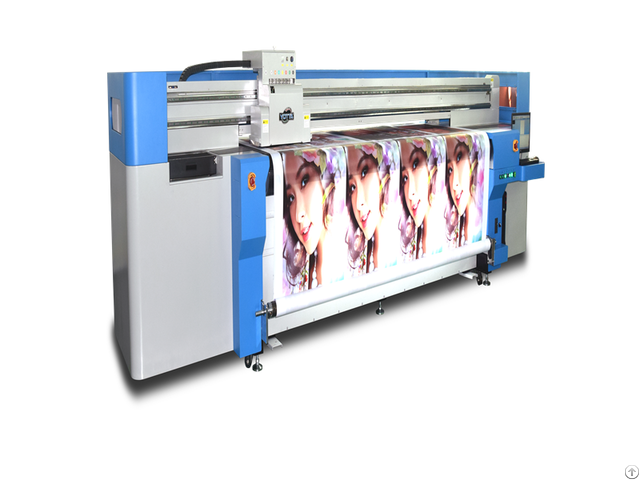 3.Automatic media positioning device makes the material position more accurate, repeat printing without deciation and it’s convenient to place the materials. 4.The vacuum adsorption platform can be changed from suction to blowing. It forms a dielectric layer between media and platform, so to ensure heavy large finished product can be moved easily. Maximum load-bearing is 50 kg/ ㎡. 5.Car anti-collision device, carriage automatically stops when colliding with obstacles.It prevents carriage and print head form damages. 1.YD2600-RC hybrid UV printer equipped with automatic cover white, white, spot color and other 16 kinds of white ink printing mode and can print special effect with varnish. 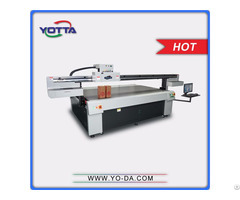 2.YD2600-RC UV hybrid printer equipped with automatically white jump printing function for increased productivity effectively, and it can also automatically recognize and avoid a blank part of the picture. 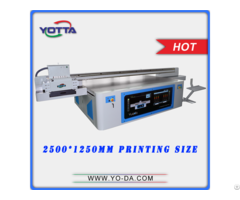 3.YD2600-RC can be set the irradiation power of two UV modulator tubes, During the bi-directional printing, it can automatically rotate according to the round-trip, and can effectively reduce the depth PASS Road. 4.The powerful nozzle compensation function of hybrid printer can use the normal nozzle replaces the missing nozzle for ink jet printing, ensuring that the picture does not appear leaky white or PASS Road. 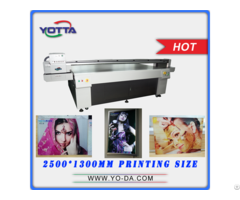 5.YD2600-RC Hybrid printer equipped with a powerful, intelligent, user-friendly RIP software, different images can be still output when superimposed, which greatly facilitates the daily color proofing work and improves printing efficiency. 6.The optional software template technology can solve the error problem in splice, make the splice error is less than 0.5mm. 7.Optional production line printing mode can fit the industrialized production line.